You know that game where somebody has three cups and they put a little ball under one and then move them around, and your job is to keep you eye on the one with the ball, and say where it is? Well, Who’s Got What game is sort of like that – only it is for practicing listening skills in a fun and exciting way. Students work in groups of four. 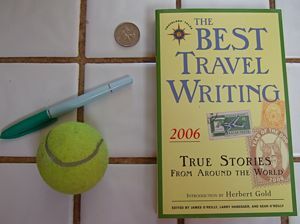 Put the following 4 objects on a table or chair: I’ve used common objects: a coin, a book, a pen, a ball. Each student will represent a number, 1-4. Students will hear instructions. 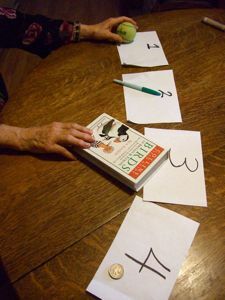 For example, “Number 2, pick up the book.” “Number 1, hand the coin to Number 4.” “Number 3, don’t pass the pen to Number 1.” The directions on the audio speed up as it plays. The object is for students to follow the directions perfectly. At the end of the audio, we see who’s got what. If something doesn’t work out, let the students start again from the beginning. You need 4 players. It’s difficult with fewer. But if you have five per group, that fifth person can be a monitor. Even beginning students can follow the instructions with some pre-listening help. The verbs used: get, give, hand, pass, pick up, take. There is more variety in the instructions here, and they come fast. Verbs used: get, get rid of, give, hand, pass, pick up, put down, take, trade. Yeah. You can practice your listening skills on your own. In this case you do all the actions. Create four squares, by using, for instance, four pieces of paper. Number them. Now move the objects to the proper places yourself (see the picture on the left). Kevin, you are AMAZING. I know publishing on the web feels like working for free at a first glance (sometimes at a second, a third) but coming around here is like getting into a whole world of yours. A very interesting world where I see a man who loves what he does. And your podcasts rox! I’m a huge fan. Congrats for such passionate work. Take care. Very creative. I’ll definitely pass this along and try it out soon. GREAT JOB! I love it!!!!!!!!! Awesome! I am using it with my kids tomorrow for a communication and listening unit in Health. They will love it! Thanks! I facilitated this activity with my training class just earlier (right after lunch) and they LOVED it! Such a great energizer, too! This is great for my study skills and social skills classes! Sound like fun. I’m always looking for different games to play with the family. This saved my life on a gloomy Friday! I teach Skills in Communication for Freshmen and my kids loved this. Thank you! Typical day in the office (Assistant Professor and Foreign Faculty Coordinator in South Korea) looking for interesting and appropriate articles that will spark discussion with students. I find nothing today. Decide to look around for other motivation. Come across a few good sites this morning, including yours. I read Jack Morais’ comment… and thought I would just echo what he is saying. Big thanks, and hope we can work together sometime. I did this activity as a guidance lesson on listening & following directions with 3rd-5th grades and they LOVED it! Thank you so much for this resource; it’s awesome! This is awesome! My students will love it.